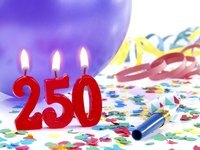 What Is the Term for a 250th Anniversary? Anniversaries mark milestones that recognize the passage of time and related achievements. Because 60 percent of the English language is based on Latin, the names you use for anniversaries have Latin origins. An event commemorating 250 years might be described as quartermillennial, with "quarter" meaning one-fourth and "millennial," a Latin-derived word meaning 1,000 years. Choosing which numerical prefix or combination of prefixes to place in front of "-ennial," the Latin term for the word category for years between events, has led to other terms for 250 years. Another accepted term for a 250th anniversary, semiquincentennial, has no dictionary listing as of publication. According to the Phrontistery.info website, most words coined for multi-century events don't appear in dictionaries until people use them regularly. Semiquincentennial means half of 500 years. Pennsylvania cities Pittsburgh and Allentown held semiquincentennial events in 2008 and 2012, respectively. The toolkit offered by the Vermont Historical Society for the 110 Vermont municipalities reaching the 250-year milestone between 2011 and 2014 used the term, while West Virginia's oldest town, Shepherdstown, used a variation -- semi-quincentennial -- to describe its festivities. The U.S. Department of Interior and the Huffington Post have called 250-year events "sestercentennials," preferring the Latin prefix for two-and-a-half, sester, to create a shorter term than semiquincentennial. Princeton University referred to its 250th anniversary in 1996 as a bicenquinquagenary, although this tongue-twister actually means 200 times 50, or 10,000 years. Huffington Post: Friday Talking Points -- Happy Sestercentennial Column! What Is a Traditional Gift for a 36th Anniversary? What Is a Traditional Gift for a 32nd Anniversary? What Is the Gift for the 17th Wedding Anniversary? What Is a Gift for a 63rd Wedding Anniversary? What Are the Colors for a 100th Anniversary?